Think of Y Combinator as a Silicon Valley boot camp for startups. Only companies that show the seedling of promise are able to attend, where they receive necessary seed money, opportunities to network with the brightest minds in tech, and — most importantly — advice from seasoned entrepreneurs and investors. For boxing wearable Hykso, that advice entirely changed their company’s trajectory. I spoke with CEO Khalil Zahar about Hykso’s technology — and why you might find it at a gym near you this fall. 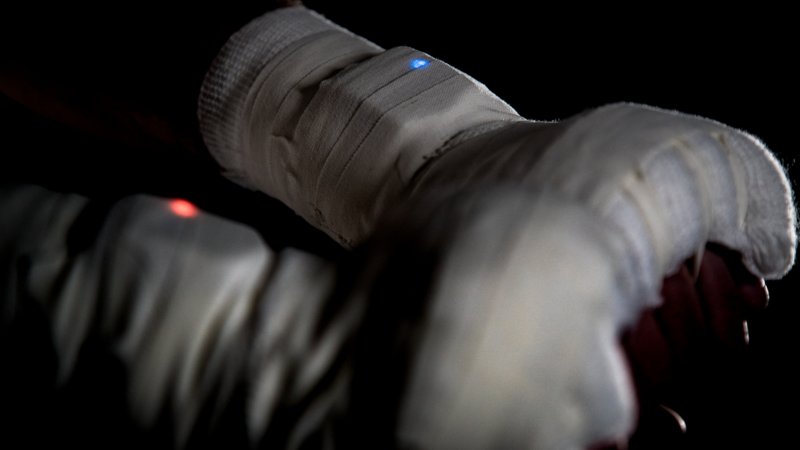 The sensors are small enough to fit inside a fighter’s hand wraps or glove, and they’re designed to measure punch speed, punch count, striking intensity, punch types, and combos. For a professional fighter, that data is vital — especially if they reach any plateaus during training. “It’s going to show you when you’re not reaching the levels you should be reaching,” Zahar says. Overtraining used to be measured by feel: a broken rhythm, reduced endurance, or mental roadblocks. Now, though, that feedback can come in the form of a smartphone app — or projections on an LCD screen. At first, Hykso was intended for pro fighters and prosumers (i.e. amateurs who buy pro-level gear). But everything changed after Y Combinator, which shifted the company’s focus toward one goal: selling the product to as many people as possible. That idea makes immediate sense in a landscape of instant gratification. To meet that need, Hykso created a gym experience for people who want to box for fitness, not necessarily to become the next world champ. The company is currently partnered with seven gyms nationwide, where Hykso’s punch data can react in real time — ideally, on a large LCD screen for gym-goers to view. Hykso, like Fitbit, is gamifying fitness. But instead of weekend warrior challenges and move alerts, Hykso’s tech is designed for fighters and hobbyists alike. Zahar notes that Hykso isn’t just a gym gadget for coaches. It meets a need that is deeply ingrained in boxing training. “The coaches were already using clickers to count the number of punches, so they can implement the technology right away,” he says. Zahar recognizes that Hykso isn’t the only punch tracking wearable on the market. 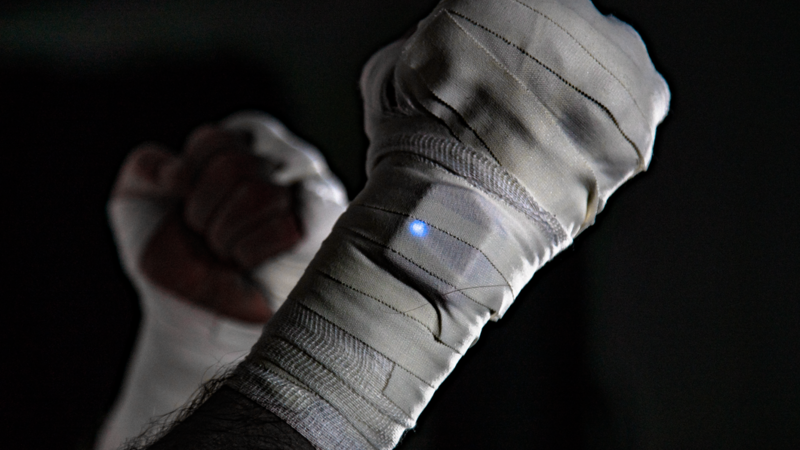 StrikeTec, for instance, is a similar wearable punch sensor being used by the UFC. But unlike StrikeTec, Hykso doesn’t measure punch force. Zahar explains that you can get a ballpark estimate of force by measuring speed and deceleration — but that ballpark can shift. It’s the difference between punching a bag, which has a measurable mass and predictable movements, and punching a living, breathing human being. “When it comes to another athlete with a moving head that is sometimes coming forward, sometimes going backward … there’s all different types of scenarios where this calculation can lead to error,” he says. Like Hykso, StrikeTec has conducted independent studies with universities to perfect its algorithms and data. At Wayne State University, StrikeTec partnered with Dr. Cindy Bir — a leading engineer who has compiled public research on Olympic boxers and athletes stretching all the way back to the ‘70s. According to Elliot, there will never be a product with 100% accuracy because “there is a lot of movement in the hand/wrist/arm versus the object being hit with similar variables,” but StrikeTec strives for the 90% to 95% accuracy zone. “I don’t try to think negatively about [other companies] or what they measure,” he adds, explaining that legitimacy is strictly dependent on the amount of research and development that has been put into analyzing as much data as possible. “The more and more they do this, the better they will become. The industry needs movement, and we are just happy to be a part of it,” says Elliot. Media Day continues with a "friendly" race between @ShakurStevenson & @NicoTheBoxer! That’s why Hykso has been used by the US and Canadian boxing teams, UFC fighter Joe Lauzon, undefeated professional boxer Javier Fortuna, and expert trainer Hector Bermudez — among others. They get to compete against each other in a context where they normally couldn’t compete. Those people don’t want to enter the ring and get punched in the face.